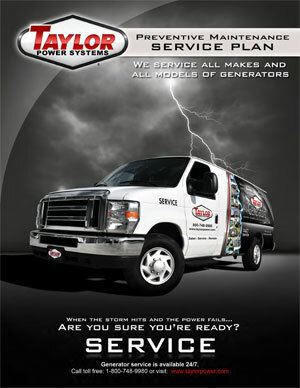 We Service all generator makes and models! Don't wait until the storm hits and the power fails! Make sure your generator is ready now! 2.) Transfer Switch Testing - Ensures the proper operation and compliance of your equipment. 3.) Fuel Polishing - Cleaning of valuable fuel source to ensure proper operation of generator unit. WHY is fuel polishing needed? Fuel stored for 6 months or more will degrade naturally, accumulate water from condensation, and grow bacteria (among other things). Many things can accumulate inside an unused diesel tank causing the diesel to turn to sludge. Stagnate diesel can become an unreliable fuel source creating an unreliable generator power source. Our service centers have trained technicians available 24/7! Learn about our preventive maintenance service agreement and Inspection process. Download a copy of our brochure today!